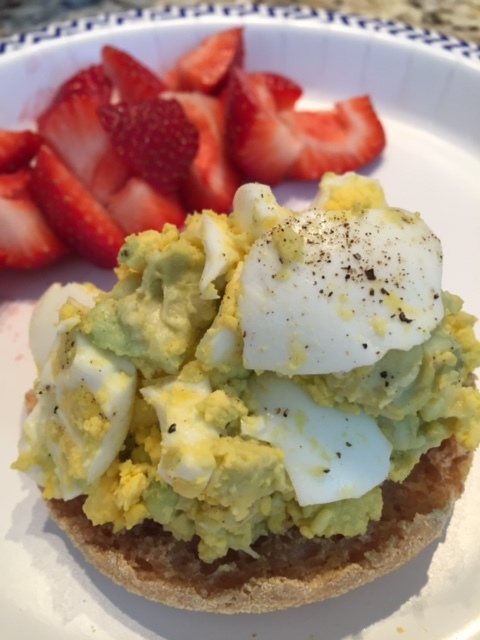 I love both hard-boiled eggs and avocado so this recipe has become my go-to lunch on 21 Day Fix. Avocado is a perfect substitute for mayonnaise in an egg salad because it has so many wonderful health benefits. However, avocados are a bit high in calories which is why about 1/4 avocado fulfills your blue container for the day if you are a Fixer. Smash up the hard-boiled eggs and avocado with a fork to desired consistency. Season to taste with black and red pepper. Serve on top of whole wheat English muffin. That’s it! I like to add a side of fruit to mine as shown in the picture. If you do the same then check off a purple container if you’re a Fixer. Enjoy!